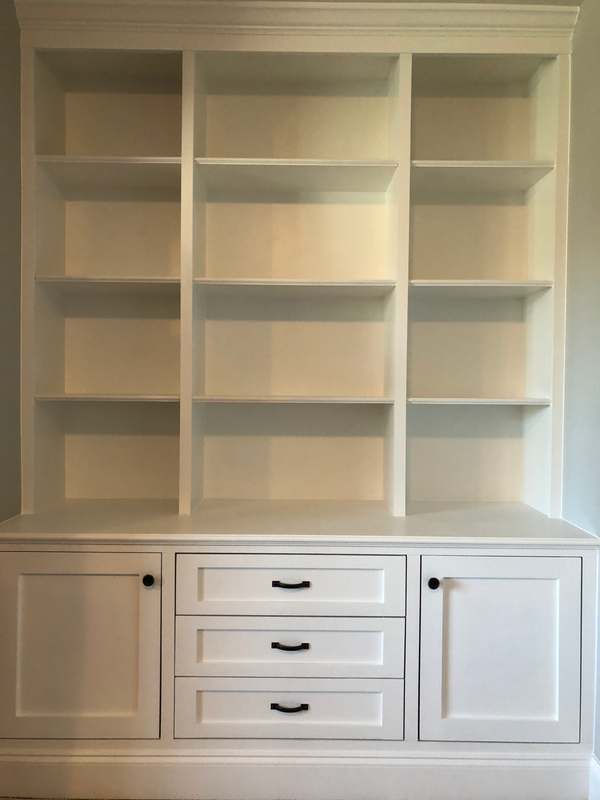 A customer contacted me to ask about the possibility of building a cabinet/bookcase similar to a Pinterest photo she had found. This unit was built to fit inside a niche that was 72″ wide and 96″ in height. This space was designed by the builder of the home to contain a dry bar which was never installed. This project was built in 6 separate sections in order to facilitate getting it upstairs in their home, then it was assembled/installed in place. The carpet was trimmed back and a new baseboard and crown molding was used to enhance the built-in look. Everything was primed and then pre-finished with PPG Breakthrough paint which was both sprayed and brushed. The outside cabinet units were finished on the inside with dark stain and water-based polyurethane. The drawers have full-extension/soft-close slides and are also finished with clear polyurethane. The doors are fitted with European soft-close hinges. A Shaker style was chosen for the doors and drawer fronts. This project was completed in 3 weeks.